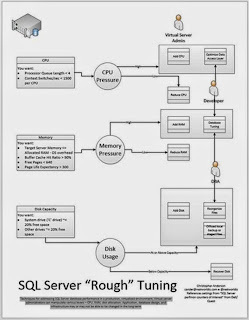 Looking for a way to address SQL Server database performance in a production, virtualized environment? There are many sources of expert advice from very smart people in the SQL Server world. But often the most well-thought, well-intentioned advice is not easily or quickly implemented in a complex organization. The reasons could be technical, political or simply availability of time and people. 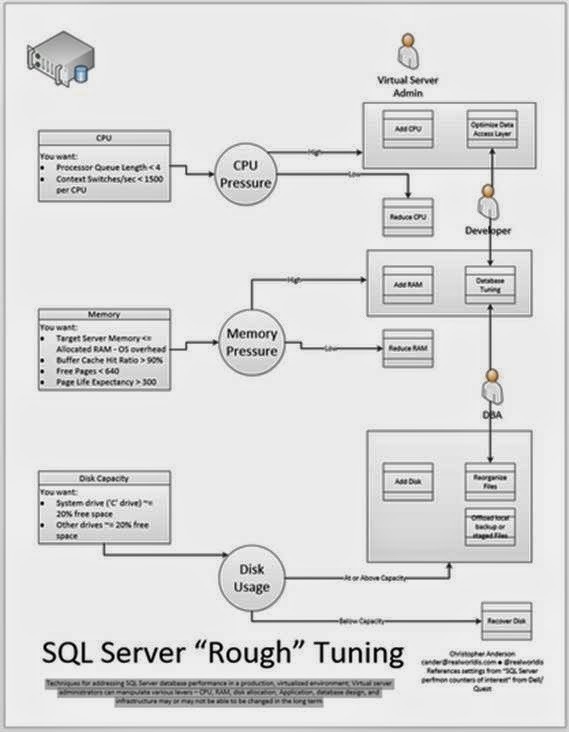 This diagram is my current approach to "rough" tuning a SQL Server: The idea that a server administrator or database administrator (DBA) can turn various knobs and flip switches to assigned scarce resources to a database server, but as a practical matter, the inner workings of a given application and database may not be changed… or at least not changed quickly. A third party vendor application with a proprietary schema, the application might have updates, but there are dependencies or license costs that take time. Took some best practices, including some selections from the guidance on the SQL Server perfmon counters of interest poster available from Dell/Quest, and added some of the basic steps available to Server administrators and Database Administrators.